Most asset classes were higher this week. The exceptions were gold stocks and some of the commodities. Ethereum, up 6.5%, and the Dow Jones Industrials, up 4.6%, topped the rising list. The biggest losses were in coffee, off 3.5%, and crude oil, down 3.0%. The USD (up 1.7%) rose more than any other national currency, while the Chinese Yuan (up 0.5%) gained the least. Short term bonds rose 1.7%, in line with USD cash, but long term bonds outperformed both, gaining 2.9%. Bitcoin had a fairly calm week, ebbing and flowing, ending up 1.7%. 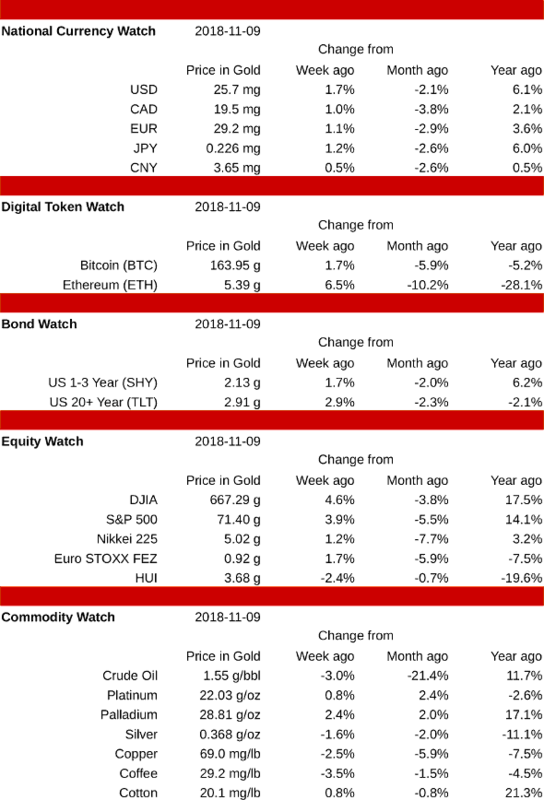 Ethereum rose more consistently and further, adding 6.5%, for the best performance of any asset class this week. Gold stocks fell 2.4%, but the other stock indexes were all higher. The DJIA was up 4.6% and the S&P 500 added 3.9%. The Japanese Nikkei rose least, gaining 1.7%. Commodities were mixed, with coffee down 3.5% while palladium rose 2.4%. Crude oil and copper were also big losers, off 3.0% and 2.5% respectively. Silver was down 1.6% while platinum managed a 0.8% gain.